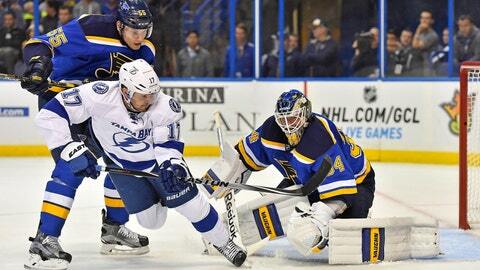 Jake Allen stopped all 26 shots he faced to help the Blues top the Lightning for the fourth straight time. ST. LOUIS — Jake Allen got a shutout and some bragging rights over friend and former teammate Ben Bishop on Tuesday night. "A shutout always makes it a little bit better, but we got the win and I thought he played really well, too," Allen said. "It was a good battle by both teams. It was a close game. We got some chances both ways but nothing major. Guys played well." Bishop — teammates with Allen for two years with Peoria of the American Hockey League — finished with 22 saves. "He played really well," Bishop said. "We came up a little short but it was a pretty good game. He’s a good friend and I’m sure I will hear it until the next game. I’ve got to get the next one." "Our goalie was good," St. Louis coach Ken Hitchcock said. "He was solid all night. He was out on top of the crease, he was aggressive. It was good to see, real good to see." "I kind of got lucky and the kid put it in the right place and I just tipped it down and beat Bishop, and that’s not easy to do," Gomez said. "Give the kid credit. He saw it, he saw me get in that spot and he got it on net." The goal was the first for Gomez with St. Louis and the 181st of the 35-year-old forward’s career. Parayko and Brouwer earned the assists. "No matter what level you’re at, it’s always nice to get a goal out of the way," Gomez said. "Most importantly, though, we got the win. That’s a good hockey club over there, so we’ll enjoy this for a bit and go right at the next one." The Blues held the 1-0 lead into the first intermission as Tampa Bay’s Alex Killorn hit the post with 11 seconds remaining in the opening period. "When you need one (goal) you’ve got to find a way to get it and we’re having trouble doing that," Tampa Bay coach Jon Cooper said. "It seems like the net is shrinking a little bit and we hit a post. Teams go through this but we’ve had a couple of good defensive efforts." NOTES: The Blues announced Tuesday they are bringing in forwards Martin Havlat and Dainius Zubrus to professional tryouts. … Robby Fabbri made his return after missing six games with a concussion. … G Andrei Vasilevskiy returned to the Lightning on Monday after recovering from a blood clot. … The announced crowd of 19,184 was the Blues’ third sellout in three games this season.